This recipe is light, filled with berries, and there is no baking (and hardly any clean up). 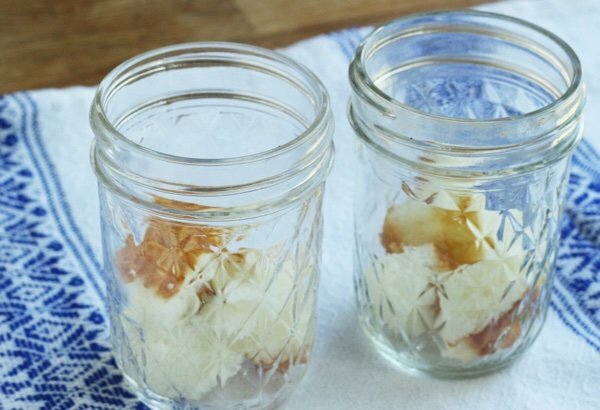 Use Mason jars if you have them or just put this dessert in a coffee cup. Who cares? It is summer so you don’t want to be cranking up your oven. I try to forget I have an oven during this season because outside feels so hot. I like to eat cold things and this is a winner. This is like a strawberry shortcake but you are eating far less cake. The small Mason jar makes a perfect portion size for a dessert – you get to eat the whole thing! I know because we discussed it a few weeks ago that people have trouble with pints of ice cream. They want to eat the whole pint! Well, it is rare to have a serving of dessert that is the right size for consumption. Small Mason jars are your friend. You can buy them in most supermarkets, hardware stores, and sometimes you can find them at Salvation Army or Goodwill. I have a stash because I have attempted canning. The instructions could not be easier. I put a few small chunks of Angel Food cake in a jar. 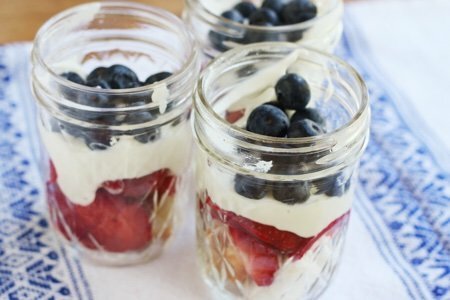 Then I layer the strawberries, ricotta mixed with sugar and lemon, and blueberries in the jar. The most important step is to refrigerate it! This way, you have a cold dessert that isn’t ice cream. It is refreshing and creamy (and only 62 calories). You can do this with any fruit you have on hand. 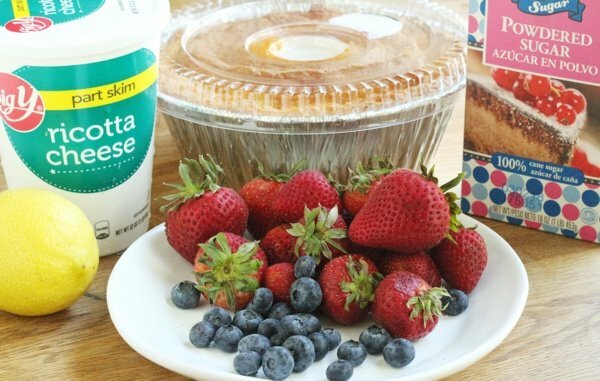 Instead of part-skim ricotta, you could use whipped cream or plain yogurt. It isn’t as stable with whipped cream so I would eat it right away (the cream deflates a bit). You could also make this with just the berries and maybe a little sugar. Who needs cake and ricotta when you have summer berries? What kind of desserts do you make in Mason jars? Mix ricotta, sugar, and lemon juice in a small bowl. Place a few chunks of Angel Food cake in the bottom of 3 small Mason jars. 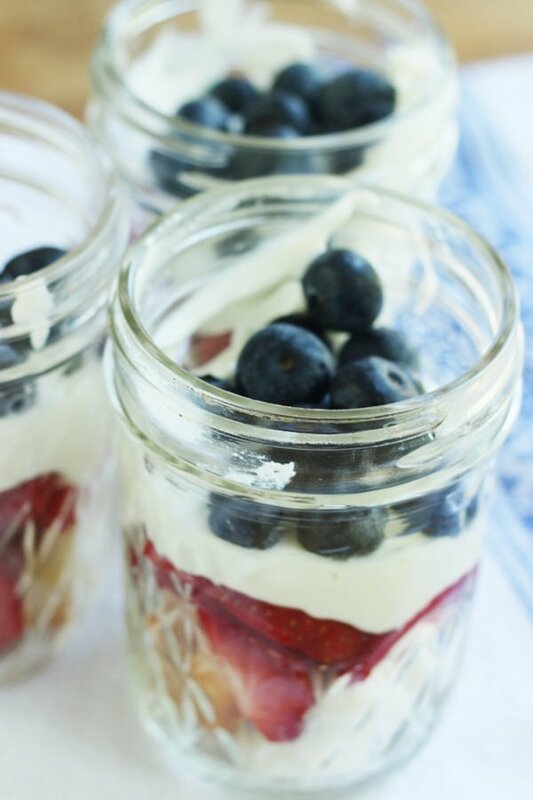 Divide strawberries, ricotta mixture, and blueberries into the jars in layers. Refrigerate for 30 minutes or up to 2 days. Enjoy cold on a hot summer’s day. Let Your Fruit Flag Fly! You know when it is hot and you don’t want to cook? This is the dessert for you! Sounds yummy! I routinely make yogurt parfaits by layering plain Greek yogurt with berries and homemade granola. The walnut crunch recipe (I cut back on the brown sugar a bit) for granola on the California walnut website is the only granola recipe I use and I sometimes substitute pecans or almonds. 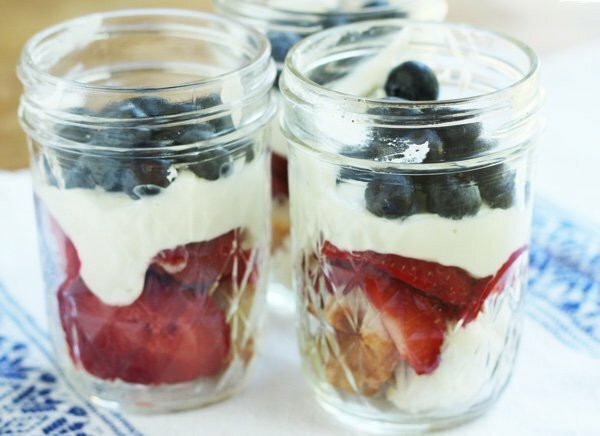 The yogurt parfaits are greatfor breakfast or dessert. For dessert, once in a while I substitute lemon or lime curd for the berries. The mason jars or even a nice 8 ounce tumbler are my favourite ways to serve this as it looks so pretty! Seems like another great aspect of this is, it is all ready when you want it, at a time you might be tempted to grab something else “easy,” like ice cream. Having things prepared is so helpful in those starving moments. Another jar idea--I love opening my fridge and seeing vanilla chia pudding and peach parfaits waiting. I like to top with raspberries and chopped walnuts. Everyone loves the casual mason jars. To make, combine three tablespoons of chia seeds with 1 cup of almond milk, a teaspoon of vanilla, and a tsp of coconut palm or maple sugar in a mason jar. Shake well and refrigerate for an hour until the chia seeds thicken up into a pudding. Peaches can be pureed with some left rough-chopped for added natural sweetness. Some omega 3's and protein in every sweet bite. The peach inspiration came from ''oneingredientchef.com''.